"Good evening, Dr. Light. Allow me to introduce myself--I am Dr. Cossack. You may not have heard of me, but soon the world will know my name. "Over the years, you have been hailed as the greatest robot designer in the world, while my robotic creations have been totally ignored. I cannot allow this to continue. The world must be made aware of my genius! "From my Siberian citadel, I've sent eight of my most powerful robots to destroy that titanium troublemaker, Mega Man. Once they have obliterated him, I will place his broken body on display for the entire world to see. Only then will I be allowed to take my place as the greatest robot designer of all time!" --From the NES Mega Man 4 instruction manual. 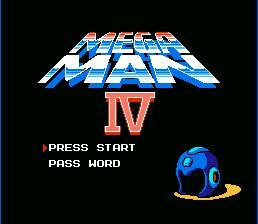 Play Mega Man 4 Now! Peace has once again come to the world after the defeat of Dr. Wily during the Gamma Project incident. That is, until Dr. Light gets a letter from a Russian scientist, Dr. Cossack, proclaiming himself the top Robotics designer and that he had created eight of his own robots which he will unleash upon the world to test Dr. Light's robots. So Mega Man must be called off his search to find Dr. Wily, and go after Dr. Cossack and his robots. Dr. Light had also given Mega Man an upgrade to his weapon, the mega buster, which gives Mega Man the ability to focus a blast that does more damage. Mega Man 4 in many ways, mostly musical, is like Mega Man 2. The intro and finale music are identical to its predecessor. The graphics have improved since Mega Man 3, as far as the Mega Buster charging and the general look of the game. This game makes an excellent fourth installment to the classic Mega Man series. Make your way to Dr. Cossack's Robot Masters to get their powers such as Skull Man's Skull Shield or Dive Man's Missiles. Each of the bosses is about the same size as Mega Man and has the same amount of health, however it is not recommended that you go in guns blazing, because each one has strengths and weaknesses that must be worked out. Each Robot Master also has a pattern in which they attack, so it is good, although not strictly necessary, to work it out. The Robot Masters include: Bright Man, Pharaoh Man, Drill Man, Ring Man, Toad Man, Dust Man, Dive Man, and Skull Man. Throughout each level you will find the E-Tank which, like in Mega Man 3, will let you recharge your health when you need it. Once again, defeat the eight robots and take their powers, which you can choose in the menu. Don't worry though, you are rejoined by your robot dog, Rush, which turns into a coil, jet, and submarine. Fight your way through the eight stages to get to Cossack Fortress where, like in the other games, you will be faced off with other robots: Square machine, the Cockroach twins, and finally, or so you think, Dr. Cossack. Every so often, Protoman makes an appearance and gives you advice. So good luck, Player, and Lock and Load!